This image, about 2 millimeters across, from NASA's Phoenix Mars Lander's Optical Microscope shows particles collected on a magnetic surface inside the lander's microscope. The particles are larger grains seen within the fine orange dust that covers most of the ground at Phoenix's landing site. 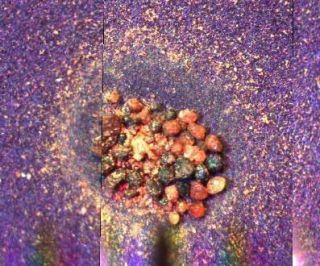 The particles vary in color, but are of similar size, about one-tenth of a millimeter. Even as itsmission winds down, NASA's Phoenix Mars Lander has spotted snow falling fromthe Martian sky. Phoenix?s camera and meteorologicalequipment have shownclouds and fog forming during the night as the air gets colder. "Thisis now occurring every night," said Jim Whiteway of York University in Toronto and lead scientist for Phoenix's Meteorological Station. A laserinstrument that is pointed directly up into Mars' atmosphere has also detectedsnow from clouds about 2.5 miles (4 kilometers) above the spacecraft's landingsite. Data show the snow vaporizing before reaching the ground. There are noconventional photographs of the snowfall. Scientists knew from previous studiesthat it snowson Mars. But they've never seen it happening from the ground. "Nothinglike this view has ever been seen on Mars," Whiteway said. "We'll belooking for signs that the snow may even reach the ground." The crafthas also seen new hints of the planet's watery past. Meanwhile, missionscientists are trying to squeeze in all the science they can before the Martiansun sets for the winter, including a surprise attempt to switch on Phoenix's as-yet unused microphone. Missionscientists announced the plans for Phoenix'sremaining weeks of activity at a press conference Monday. They alsorevealed information that will help them to "begin rewriting the book ofMartian chemistry," said Michael Hecht, of NASA's Jet PropulsionLaboratory (JPL) in Pasadena, Calif., and lead scientist for Phoenix'sMicroscopy, Electrochemistry and Conductivity Analyzer (MECA). Phoenix landed in the northern plains ofMars on May 25 and has been using its onboard instruments to analyze theMartian dirt and subsurface ice layer at its landing site above Mars' arcticcircle. The mission, extended once by NASA through the end of September, wasextended again earlier this month through the end of December. But it's unlikely Phoenix will last that long. As winterapproaches in the Northern hemisphere of Mars, the sun dips lower in thehorizon, providing Phoenix' solar arrays with less and less sunlight to convertinto electricity to run its instruments. Eventually the sun will set above thearctic circle alltogether. As thishappens, the Phoenix team is "trying to get the most out of these scienceinstruments in the last few days," said Barry Goldstein, Phoenix projectmanager, also of JPL. Scientistsworking on Phoenix's Thermal and Evolved-Gas Analyzer are planning to attemptto fill the instrument's four (of eight total) remainingovens will Martian dirt and ice samples. The team particularly wants to geta pure-ice or ice-rich sample, said TEGA lead scientist William Boynton of the University of Arizona, Tucson. The teamhas run into problems gathering ice samples, with the "ice almost weldingitself to the inside of the scoop" on the end of Phoenix's robotic arm,Boynton said, though he added: "We're still optimistic that we can fillall four before we run out of power." Phoenix will also look for signs oforganics in the samples delivered to TEGA, by comparing them to a blank broughtto rule out any contamination brought from Earth. While they would be athrilling find, organics would not necessarily indicate life ? they could bedeposited by comets and preserved in the ice, said Phoenix principalinvestigator Peter Smith, also of the University of Arizona. The landerwill also look at the different isotopes (or types of an element with differentnumbers of neutrons) in the subsurface ice and the water vapor in the Martianair to see whether the two water sources interact, Smith said. As a bonus,mission scientists are going to try to switch on the microphone that wasoriginally installed on Phoenix to be used during the lander's descent. Whilethat use was scrapped, the Phoenix scientists have to decided now to "tryand listen to Mars for the first time," Smith said. "We'renot sure if it's going to work, but we're going to make a try," he added. Phoenixwill also try to sample the dirt underneatha rock, dubbed "Headless," that it successfully moved with its7.7 foot-long (2.4 meter-long) robotic arm last week. Images have already shownsome color differences in the dirt under the rock. "We'rehoping to find a different chemistry under the rock than next to therock," Smith said. So far, thechemistry of the surface layers near Phoenix's landing site has been a bitdifferent that anticipated. TEGA hasidentified several minerals that suggest that the surface there has interactedwith water sometime in the Martian past. These include silicates similar instructure to mica, only softer, and calcium carbonate. Examples of carbonateson Earth are chalk and antacid tablets. The suiteof MECA instruments have shown that the pH of the soil near Phoenix isapproximate 8.3 ? or slightly basic ? "almost exactly the pH of oceanwater on Earth," Hecht said. MECA hasalso found evidence of perchlorates, which could act as an energy source forany potential past Martian microbes and could have a significant impact onMars' water chemistry. For onething, they could help explain why Phoenix's fork-likeprobe has found that "the soil in our little corner of Mars is very,very dry," Hecht said. Perchlorate could be soaking up any water in thesoil above the ice layer, he explained. Based onmodels of Phoenix's energy decline, mission engineers don't expect Phoenix to last much past late November. Eventually, the sun will set on Phoenixcompletely, and carbon dioxide ice will likely deposit on it. That combinedwith the ever-decreasing temperatures of winter will likely destroy thespacecrafts components. "Nobodyanticipates that the vehicle will survive that harsh winter," Goldsteinsaid.